The Memorial Candle Program has been designed to help offset the costs associated with the hosting this Tribute Website in perpetuity. Through the lighting of a memorial candle, your thoughtful gesture will be recorded in the Book of Memories and the proceeds will go directly towards helping ensure that the family and friends of Patricia Nissen can continue to memorialize, re-visit, interact with each other and enhance this tribute for future generations. 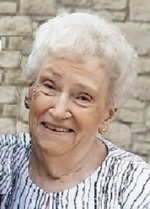 Preceded in death by husband, Robert; sisters, Audrey VanDusartz, Joyce Crown. Survived by daughters, Jan Langer and Deb (Nelson) Porter; grandchildren, Wesley (Julie) Porter, Jacki Langer; great-grandchildren, Clara Porter, Quinn and Dylan Knudsvig; sister, Wilma Olson. Celebration of Life Service, Saturday, February 17, 2018 at 11 AM at Community of Grace Lutheran Church, 4000 Linden Street, WBL. Visitation 10-11 AM. Private Interment. Memorials preferred. To send flowers to the family of Patricia Louise Nissen (Davenport), please visit our Heartfelt Sympathies Store.